Darren thrives on hyper-driving criticisms, dark revelation and lunacy. His ability to command the undivided attention of an audience is remarkable. He is currently touring celebrating the release of his 6th official comedy release RankNVile recorded live in October 2018. He is the only comedian in Canada to independently release four full length standup comedy DVD’s and 2 CD’s, all of which are available in his comedy box set The Darkness Within: 25 hours of Uncensored Comedy . Darren was nominated twice at the 2014 Canadian Comedy Awards Including Best Male Standup. 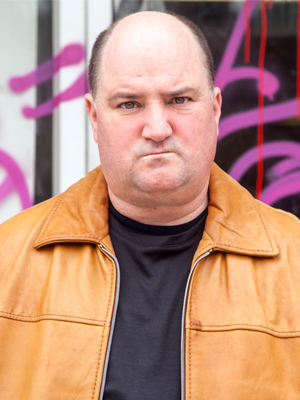 He has been mentioned four times in the top ten comedy moments of the year by Toronto entertainment magazine Now. Multiple appearances at various comedy festivals across Canada including Just For Laughs and the Winnipeg Comedy Festival. Darren has been awarded the prestigious Kari award for Best Performance in a Commercial in Canada. Most recently he appeared in the 2018 Halloween special of Murdoch Mysteries and worked with Nicolas Cage in the movie Pay The Ghost. Darren was also part of the cast of the hit CBC show Mr. D playing the new addition of angry French teacher Norm. He also had appearances on Lost Girl, Strombo and the CBC Debaters. For three years he was the host of the popular weekly Sirius XM radio show Anything Goes which was nominated two years in a row for a Canadian Comedy Award. Numerous movie/television appearances to his credit including Hairspray with John Travolta, the Ethan Hawke film Assault on Precinct 13, the Drew Barrymore/Jimmy Fallon film Fever Pitch, a role in the Michael Douglas feature Don’t Say A Word, principle role in the Kojak series starring Ving Rhames. Darren lends his voices to a many cartoons including: Total DramaRama, Ranger Rob, WishFart, Total Drama Island Ridonculous Race, Looped, Camp LakeBottom, Chuck and Friends, BeyBlade, Bakughan Brawlers, Stoked, Sixteen, NBC Discovery Kids Time Warp Trio, PBS’s Timothy Goes to School, Showtime’s Gahan Wilson’s The Kid, and Fox’s Medabots. He also has been featured in many memorable national commercials currently the Cash For Life Fairy, and old favorites Microsoft’s Hermes Messenger of the Gods, and Listerine’s Action Hero Bottle. Not of this earth or simply full of fudge: you decide. Direct from Brantford, Ontario, he’ll have you convicted and healed all at once. "The show was great! We will definitely be using your service again and I would highly recommend Darren Frost to others!" -Jenn Major, Office Controller, Trackless Vehicles Ltd.